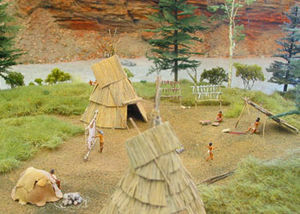 MASCOT MINE DIORAMA - HEDLEY B.C. 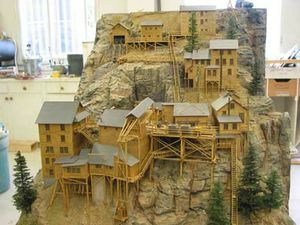 This project is a large diorama depicting the Mascot Mine above the town of Hedley, BC, as it looked during its heyday as a gold mine. 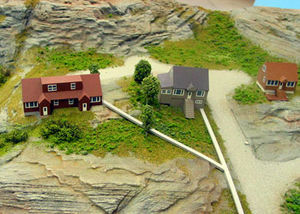 The model shows the mine buildings and both sides show cut away vignettes of the underground shafts and tunnels. 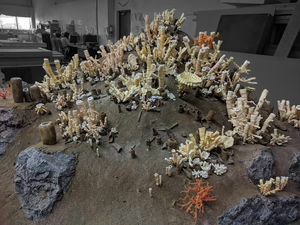 This is a diorama at a scale of 1/8” = 1 foot. 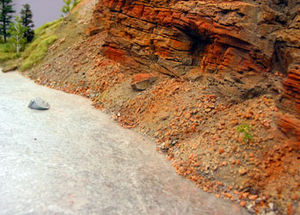 The rocks are carved from high density foam and painted to illustrate the intense colors of the site. The figures were adapted from “over the counter” products. 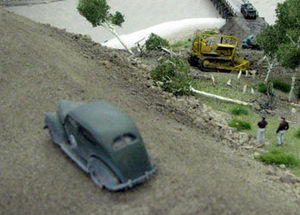 All the other elements were scratch built. 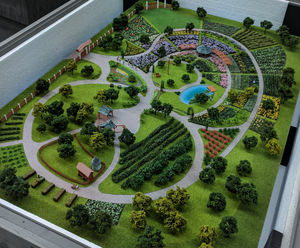 This is used in a visitors center. 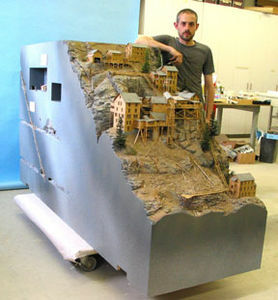 This diorama at a scale of 1:75 was commissioned as a 3D historical document of a mining company town site that was going to disappear due to development. 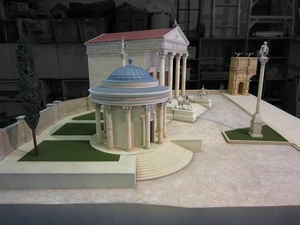 The ground plane was contour cut from high density foam and then carved and painted to illustrate the colors of that site. 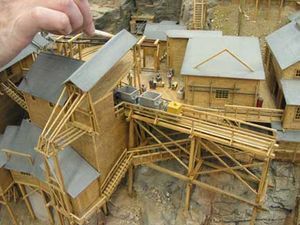 All the structures and other elements were scratch built from photos. 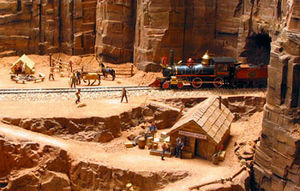 This 1/8” scale diorama is for use in a visitors center. 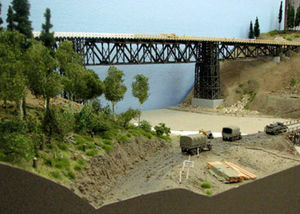 It features an under-construction model of one of the first bridges erected on the Alaska Highway north of Dawson Creek B.C. 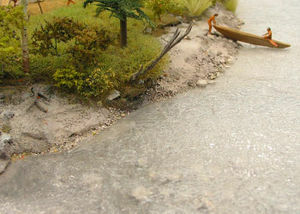 The small scenes illustrate some of the challenges that faced the road builders and the technology available to them at the time. 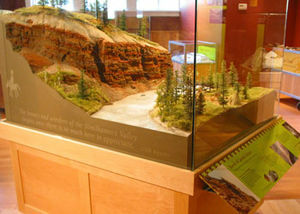 Those subjects are also to be addressed in other displays in the visitors’ center. We had the actual construction drawings for the bridge, which we redrew to enable us to cut the bridge parts by laser cutter from acrylic sheet plastic. 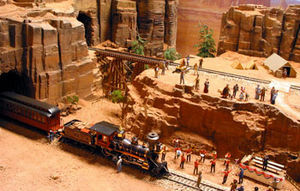 Most of the vehicles and figures were adapted from “over the counter” model kits. 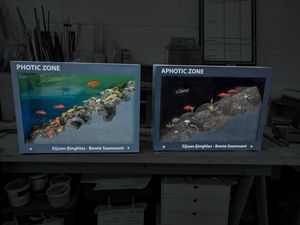 These were altered and painted to serve the purposes of this model. The ground plane was contour cut from actual surveys and then smoothed and carved to shape. 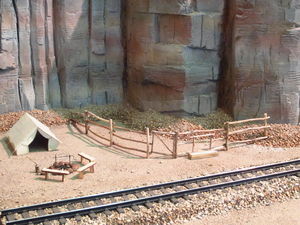 All trees were handmade and a variety of materials were used to create the model surface. 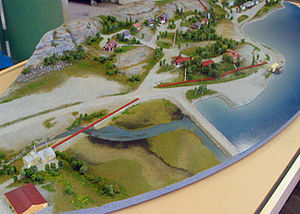 In the final display a backdrop is installed behind the model. 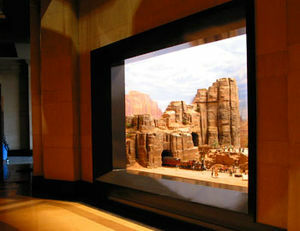 This is a 14 foot wide prop that was created for the movie “Night at the Museum”. The scale is near ½” to the foot. 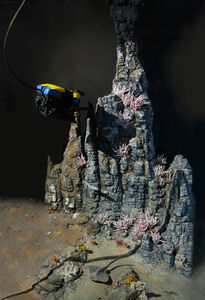 The rockwork was hand-carved from high density foam, and then painted and “scenicked”. All other elements (buildings, bridges, etc.) were scratch built. Multiples of some the model elements (barrels, crates etc.) were cast in rubber molds.